The diamond industry is ahead of the game with procedures such as the Kimberley process – where dealers must make sure the diamonds come from conflict-free areas – and there are even now fully tracked diamonds, such as Forevermark or Canada Mark that come accompanied by a certificate with a tracking number and the source. When it comes to coloured gemstones however, the discussion becomes more complicated. Firstly, due to the number of species and varieties existing, secondly by the fact they are mined in 47 countries across the globe. Most of the mines are informal and in developing countries, where smuggling is still rampant and record keeping is intentionally ignored. When the gemstones reach closer to the end of the supply chain, dealers dont usually categorise and store them according to their source, but rather according to their colour, size and shape to create parcels of matching stones, which is much more practical when selling. Therefore, the information regarding the source of the gemstone is most often lost, and this is key to knowing the labour condition in the area and the political context and then determine whether a certain gemstone is ethical or not. There is a lot of research work involved and not many willing to do it. If a gemstone is what is wanted however, in-depth gemmological testing in a specialised lab can indicate the origin of a stone, but this is an expensive process that is only financially practical with fine quality gemstones that fetch high prices. The consumer has a crucial role in illuminating the gemstone trade and the most important thing a shopper can do is ask questions. What gemstone is it? Where does it come from? How did it get here? Usually, the shorter the supply chain, the better. It is important to find a jeweller you trust and who has a good reputation and ask if they have any supporting material they can supply with the gemstone. Sometimes the stones come with a certificate indicating the source (this is the ideal case), other times the jewellers have contacts with either reputable gem dealers or directly with small mining communities and they can offer details regarding the provenance. Trust is still prevalent in the trade. It is true that in a lot of cases the origin of vintage gemstones is completely unknown and right now, on the market, there are a lot more historically mined gems that new ones. Considering that the coloured stones market has been rising, the option of completely wasting all the beautiful gems of the past and relying only on new sources is not practical and far from being ethical. It would add more pressure on the trade and without sound procedures for ensuring sustainability it would simply encourage illegal mining and smuggling. At the other end of the spectrum if you completely stop buying coloured stones from developing countries you simply cut off the income source for entire communities, who in most cases have no alternatives for survival. Everything that is salvaged and recycled is considered an ethical option, even when it comes to gemstones and it is supported as such by the RJC (Responsible Jewellery Council). 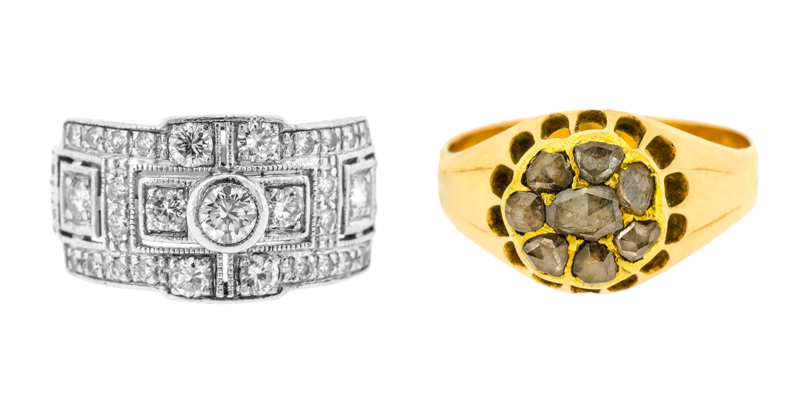 We specialise in recycled stones at Lilas and it is quite satisfying to be able to reintegrate old stones into new jewellery, especially that the work to take out, clean, sort and test stones from vintage pieces is a lot more involved than just buying a parcel of new ones. Having a recycled stone is a more reasonably priced option as well and budget is often the decision maker when it comes to buying jewellery. The new consumer generations are more aware of the international context and they better understand that their buying choices can have tremendous consequences for somebody on the opposite side of the globe, and the consequences can be either positive or negative. Once the consumers know the risks involved and that there are ethical alternatives they are more likely to opt for them, especially if this is not making a huge impact on their wallet. The post A buying guide to ethical jewellery appeared first on JFW MAGAZINE.